One of the most frequent questions we are asked in the yarn store is "What yarn do I need for this pattern?" and we don't always stock the specified yarn so we need to recommend a similar one. 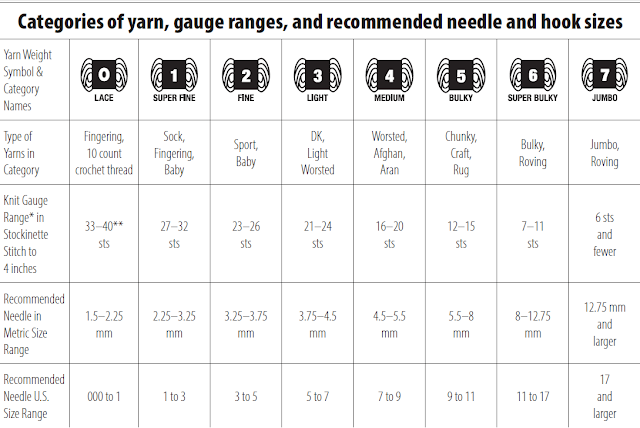 Fortunately, the Craft Yarn Council publishes a set of yarn standards (see www.yarnstandards.com) so first of all I refer to the top of their handy dandy chart of standard yarn weight system (see below) to figure out as much as I can about the recommended yarn. Sometimes the pattern will specify the type of yarn e.g. DK weight. 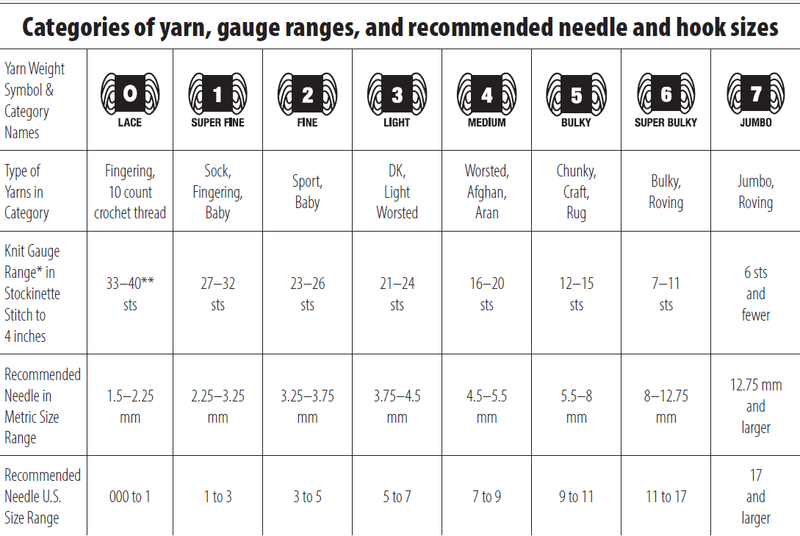 If this isn't given I look at the recommended needle/hook size and also the gauge for knitting patterns (i.e. a certain number of stitches per 4 inches / 10 cm) which often appears on yarn labels. So armed with this information, I'll look on our shelves at similar weights of yarn and scrutinize the labels for something to suit. If the pattern doesn't give a weight, hook/needle size or gauge I'll look it up on the yarn page of the always helpful Ravelry site. I'll also try to make sure the fiber content is similar e.g. cotton will not drape as well as wool. Finally I'll look at yardage so that they have a sufficient amount. And of course if you don't fancy going through all this palaver, just ask the yarn store staff for advice! For further reading on matching yarn beyond gauge see this fantastic guidance on how to substitute from newish website Yarnsub. And you've guessed it, they provide a really useful tool to look for yarn substitutions on their site so if you're not in the yarn store but at home you could take a gander at this. I could spend quite a few hours typing in different yarns and looking at the substitutions "wow, how fascinating - I never knew those two were a 93% match". It's almost like dating for yarn, but perhaps that's just me! Still on topic, I bought the magazine Love of Crochet for the first time and just love the fact that for every pattern they provide three additional yarn substitutions based on whether you want to save, spend or splurge. Marvelous! Thanks for putting up this list. I have now been able to condense my 3 or 4 separate lists into one to make it much easier for me to match knitting needles and wool as in Australia, our wool labels are very different. I'm pleased it was helpful for you. The Craft Yarn Council has a lot of useful information on their site!